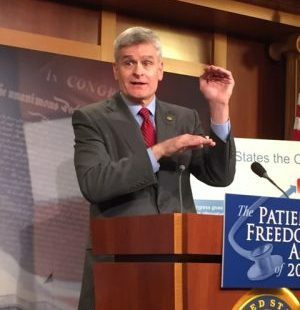 WASHINGTON – Republican Senators Bill Cassidy (La.) and Susan Collins (Maine) said their developing Obamacare replacement plan would seek to cover more uninsured individuals than are covered by the Affordable Care Act by expanding the risk pool and eliminating participation mandates. The Patient Freedom Act of 2017 would allow states to opt out of participating in the ACA exchanges or remain enrolled if they choose to do so. The legislation also contains an automatic enrollment provision much like entitlement programs such as Social Security and Medicare, which retroactively kick in when an individual reaches age of eligibility. Cassidy, who is a physician, said an insurance company that was consulted about the plan said the automatic enrollment provision could help reduce health care premiums by about 20 percent while maintaining coverage for those who are sick. Cassidy told reporters that Senate Majority Leader Mitch McConnell (R-Ky.) has been informed of the proposed plan but is waiting for the legislation to evolve before making a decision as to whether or not he will support it. Collins, who said on the Senate floor last Tuesday that the ACA should be not repealed until replacement legislation is crafted, nevertheless acknowledged that the law is financially burdensome. Collins said the replacement bill is still in progress and will likely be amended as it develops. Collins said in response to a question that popular protections granted by the ACA such as providing coverage to people with pre-existing conditions and keeping children on their parents’ insurance plan until age 26 will be included in the legislation. Less than two weeks ago, Congress approved a budget measure that lays the groundwork for repealing the ACA. Democrats have argued that repealing the ACA, which is regarded as the hallmark legislative achievement of the recently vacated Obama administration, would risk leaving millions without health insurance. President Donald Trump and House Speaker Paul Ryan (R-Wis.) have both stated that they wish to repeal the Affordable Care Act and replace that law with legislation that would seek to maintain some of the more popular protections guaranteed to policyholders by the ACA. Trump has stated that repeal and replacement must occur simultaneously. Shortly after his inauguration on Friday, the new president signed an executive order that curtails many of the ACA’s enforcement provisions.